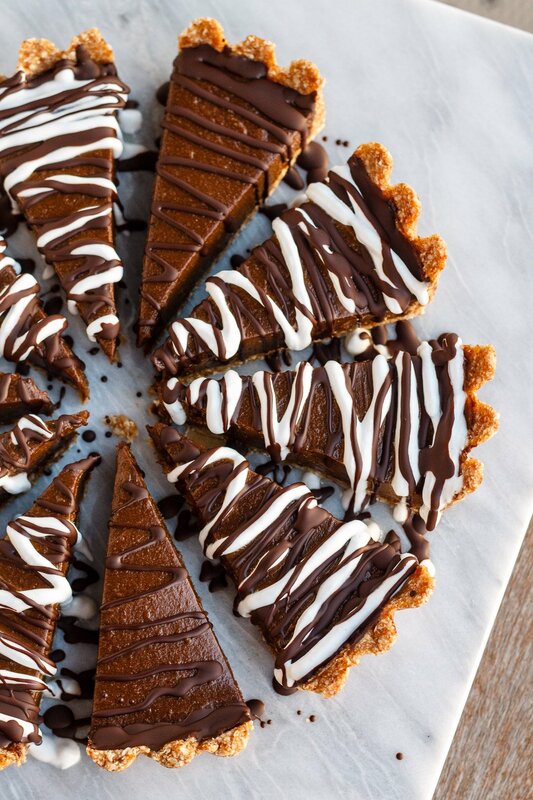 I made this chocolate avocado tart twice due to an abundance of summer avocados and because it was just that good. 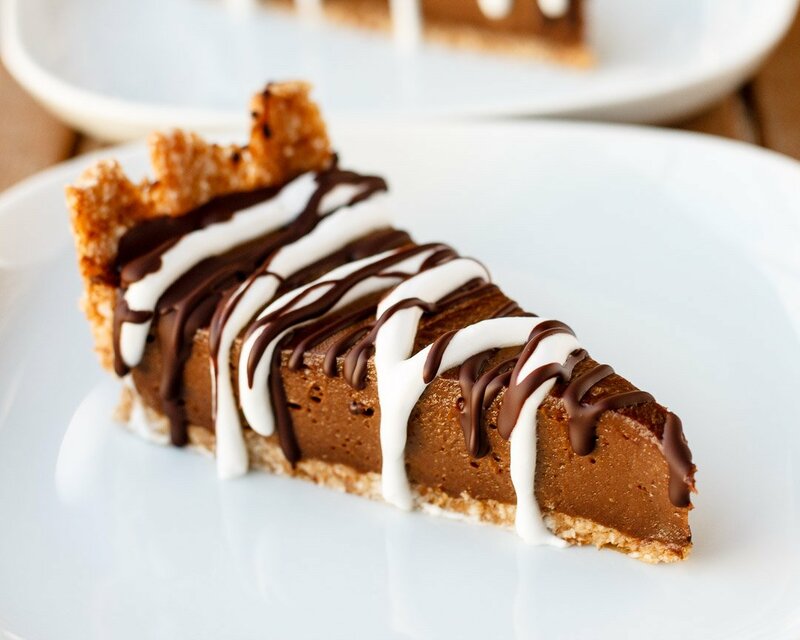 For a dessert that’s vegan, gluten free, and raw, it’s incredibly rich in taste and texture, somewhere between a ganache and a chocolate silk pie. Based closely off the original recipe from one of my favorite vegetarian and gluten-free cookbooks, the key addition in my recipe is coconut cream, which completely hides the avocado flavor. I also used slightly less dates to reduce the sugar content and added a dark chocolate + coconut drizzle as a finishing touch. Soak the dates in hot water in separate bowls for 20 minutes. Drape a sheet of plastic wrap inside a 10-inch tart pan with a removable bottom. This really helps get the tart out of the pan, otherwise it might stick. Drain the dates for the crust and put them in a food processor with the coconut. Pulse until finely chopped and starting to clump into a large mass. Press the mixture into the bottom of the tart pan and 1 and 1/2 inches up the side. Rinse the food processor and shake dry. Drain the dates for the filling and put them in the food processor with the scooped out avocado flesh, cocoa or cacao powder, coconut oil, maple syrup, salt, and coconut cream. Pulse until the mixture is pureed, scraping down the bowl a few times. Don't worry if there are little bits of date left. They will continue to hydrate and disappear later. Spread the filling in the crust and chill in the refrigerator for at least 4 hours, preferably overnight. I cover the tart pan with a big plate or lid. When ready to serve, remove the tart from the pan, carefully peel away the plastic wrap, and slice into 12 pieces. Break the bar of chocolate into pieces and place in a small bowl. Bring a small pan of water to a simmer, them remove from heat. Put the bowl of chocolate into the pan. Be careful to not get any water inside the bowl. Let sit for 5 minutes, then whisk until smooth and melted. Remove the bowl and wipe the bottom dry with a towel. 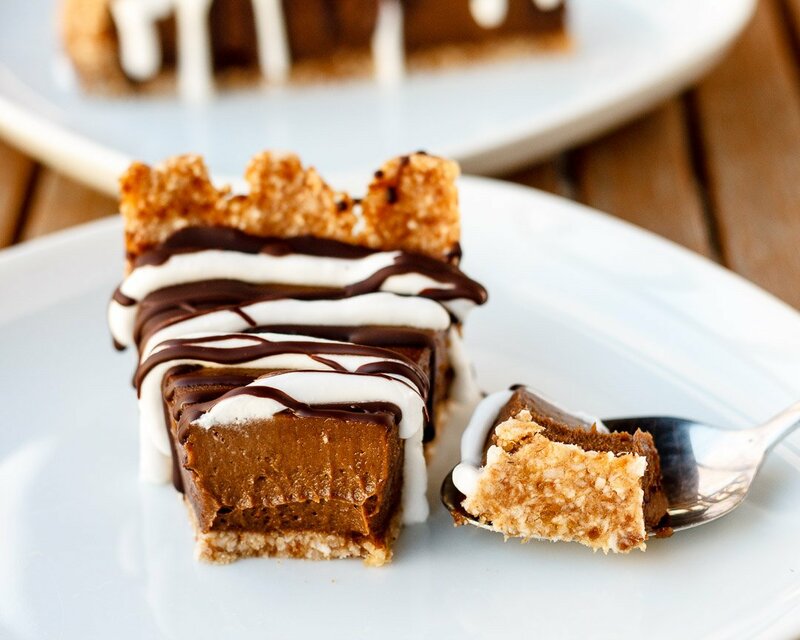 Drizzle the melted chocolate over each slice with a spoon. Drizzle coconut cream over each slice with another spoon and serve. The tart will keep in the refrigerator, airtight, for up to 5 days. It also freezes and defrosts well. I was planning to submit the recipe for my school magazine. Will you permit me to use one of the gorgeous photos of the tart so that the readers have an idea of how it looks like? Hi Azra, sure, no problem! As long as you credit supernummy.com as the photo source somewhere in the recipe or article. Thanks! Hi, your recipe looks great! I was looking for something to make that is both vegan and soy-free. Is the cocoa powder sweetened or unsweeetened? Thanks! What is the best way to slice it to make the pieces so clean cut? This just looks beautiful! I made the crust this afternoon and am going to make the filling in the morning. You can freeze it for 30 minutes, but it should be very firm after being chilled in the fridge. Just use a very sharp knife and wipe it clean after each slice. Hope that helps! These look so amazing! Love that you used avocado! Looks and sounds great! Pinned! 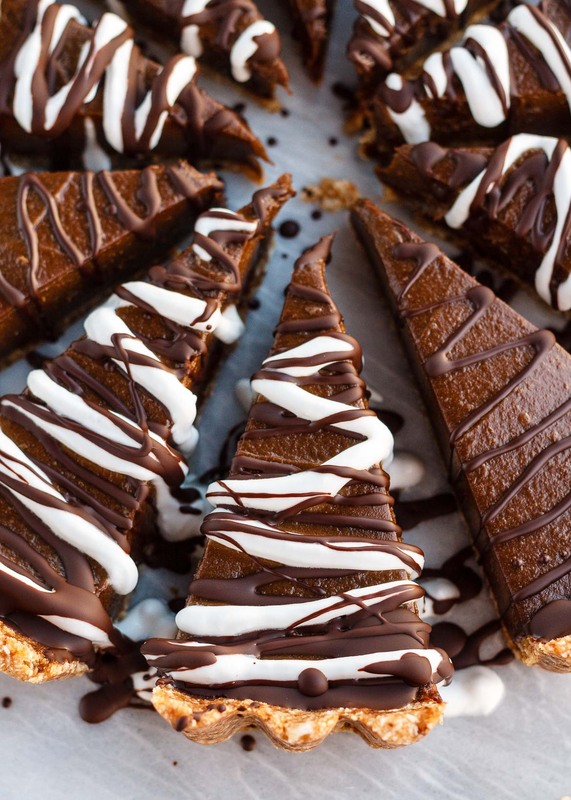 These tart looks amazing! I’m wowed by the fact that its made with avocado! YUM! Hi Emily! Thank you! Me too, I wish I had this to eat right now 😛 The hardest part is waiting for the avocados to ripen!